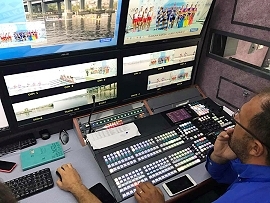 ACTAMEDYA provides broadcast services at rowing event in Istanbul. Istanbul, September 2017: This month's major rowing event in Turkey - the Balkan Rowing Championships - was transmitted live on television with the production being organised by ACTAMEDYA. The races - organised by the Istanbul Metropolitan Municipality and Turkish Rowing Federation - involved 240 participants from Turkey, Albania, Bosnia Herzegovina, Bulgaria, Greece, Macedonia, Romania and Serbia. The event was aired live on TRT Spor and Istanbul Web TV. To produce and transmit the two-hour, live championships, ACTAMEDYA deployed HD wireless transmission systems covering a six-kilometre area. As well as having eight fixed cameras at the start and finish points, the company used two cameras on a zodiac boat as well as flying a drone overhead. The graphics service was also provided by ACTAMEDYA. ACTAMEDYA has been providing turn-key broadcast services solutions for a number of sporting events including soccer, basketball, cycling, athleticism, swimming, motorcycling, sailing, triathlons and motor racing. It has supported a number of international sporting organisations and been responsible for providing broadcast services at major events such as the Presidential Cycling Tour of Turkey and the Istanbul Marathon. It was also responsible for organising the world's first 5-point 4K (UHD) videoconference.